Brokerdealer.com blog update is courtesy of MarketWatch “Japan may be set for world’s biggest IPO”. While in America, broker dealers anticipate the launch of a $2.87 billion IPO for GoDaddy.com, Japan Post Holdings is slated to break records with the launch of their IPO. Last year, China’s Alibaba Group unleashed a monster of an IPO, the world’s biggest to date. But this year, Japan has a monster of its own that by all accounts could blow past the Alibaba listing to become the most massive offering of stock ever seen. It is easily the hottest topic around the boardrooms and izakayas (after-work drinking halls) across Tokyo: the highly anticipated initial public offering of Japan Post Holdings, the finance-ministry-held behemoth that combines the national postal service with the country’s biggest savings bank and major insurer. Its financial arm alone had ¥205 trillion ($1.71 trillion) worth of assets under management as of December, roughly one-third the entire annual GDP of Japan. The offering has been more than a decade in the making, surviving fierce political controversy since the idea of privatization was first introduced. The issue was a sensitive one because not only does Japan Post bring in a massive amount of revenue, but also it’s the nation’s largest employer. Finally, with the government determined to shore up Japan’s debt-bedraggled finances, the stock appears ready to go to market sometime this autumn, with the ministry having set a goal of ¥4 trillion yen, or about $33 billion, for the divestment proceeds. It has earmarked the funds for rebuilding parts of northeastern Japan destroyed by the 2011 earthquake and tsunami. Such an amount would dwarf Alibaba’s BABA, +1.06% $25 billion haul — to date the largest in history. Still, much of the details have yet to surface, and according to the Nikkei Asian Review, the event may come as a trio of listings: Japan Post Holdings, along with separate tickers for its subsidiaries Japan Post Bank and Japan Post Insurance. Likewise, some reckonings see the issue as pulling in a somewhat more modest $10 billion-$20 billion. In discussing the big Japan Post sale, those with longer memories note similarities with the situation a quarter-century ago, when the government privatized its fixed-line carrier, Nippon Telegraph & Telephone 9432, +0.28% NTT, +0.85% Unusually for Japan, its listing was a big event not just for institutions, but for retail investors as well. Japan’s Daiwa Securities Group Inc., its research arm and Japan Exchange Group Inc. said Tuesday they signed a joint-venture agreement with Myanma Economic Bank to establish Myanmar’s first-ever stock exchange in Yangon. The deal is the latest tangible sign that plans for Yangon’s stock exchange, which the government aims to have up and running by October 2015, are moving forward. Japan Exchange Group and Daiwa Institute of Research would “continue to contribute to the development of Myanmar’s capital market and the expansion and deepening of economic relations between Japan and Myanmar through the establishment of Yangon Stock Exchange,” the companies and Myanmar’s state-owned bank said in a joint statement. The deal followed an agreement signed in May 2012 between Daiwa Securities and the Tokyo Stock Exchange to help set up the exchange after Myanmar began opening up the previous year following nearly five decades of military rule. 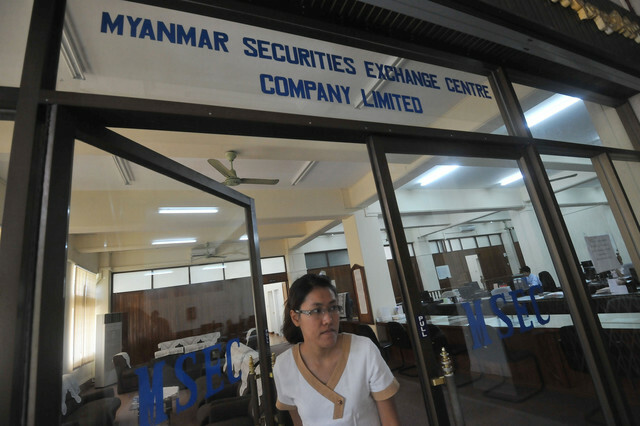 In November, the former headquarters of Myawaddy Bank in Yangon was chosen to house the stock exchange. Building renovations will be finished by June or July, according to Myanmar’s deputy finance minister, Maung Maung Thein, in preparation for the exchange’s launch. Despite the progress, analysts have said they remain skeptical that the timeline for the exchange is achievable, given the multiple delays in overhauling Myanmar’s once military-dominated financial system. In a note to clients earlier this month, political risk consultancy Vriens & Partners wrote that “serious doubts remain as to whether the stock exchange will be ready to move forward” by mid-2015. The consultancy also said that “questions remain around technical know-how” required to set up the exchange. For the entire story from the WSJ, please click here.